Frankie Smith brings over 12 years of experience in health care to her positions as a mental health clinician, policy analyst and director in Aboriginal health. Her writing experience has primarily been in the area of strategic planning and policy development. She holds a Bachelor of Arts from the University of Winnipeg. Referred to as "sweet root," licorice is used in both Eastern and Western medicine to treat conditions such as peptic ulcers. There are many side effects and possible drug interactions with the pure herb form of licorice, however the red licorice found down your candy aisle contains none of this root, according to the U.S. Food and Drug Administration. Red licorice is a generally safe treat to add to your diet in moderation. Licorice supplements are available at many alternative health stores. Some of the positive health uses for licorice, including treatment of ulcers, eczema, obesity, bronchitis, heartburn and underactive adrenal gland function. However, few studies are available to support the efficacy of purported uses. True black licorice has many potential side effects, including a dangerous condition in which you become excessively sensitive to a hormone in the adrenal cortex, according to the University of Maryland Medical Center. The licorice herbal supplement may also interact with several drugs including insulin and blood pressure medications. None of the licorice candy produced in the United States contains any of the true licorice herb. Instead, it is manufactured with anise oil, which has a similar flavor. Red candy licorice contains artificial flavoring that makes it taste like licorice, but without the serious side effects or drug interactions. Anise seed simulates the flavor of the shrub but contains none of the healing or dangerous properties of the herbal remedy. A typical serving of four pieces of red licorice contains approximately 160 calories, 5 grams of fat, 36 grams of carbohydrates, 1 gram of protein, 19 grams of sugar and 95 milligrams of sodium. Red licorice is a healthier choice than an ice cream sundae, however it still contributes to additional weight gain if you aren't mindful of portion size. A typical serving packs a large punch with carbohydrates and sugar. Licorice candy is a simple carbohydrate that will be converted to glucose quickly in your blood, possibly contributing to high blood glucose levels. Consuming licorice candy in excess may prove harmful to you in the long term. Hyperglycemia is of particular concern if you have diabetes, a group of illnesses where the insulin required to control blood sugar isn’t properly used by or available for your body. If you have celiac disease, otherwise known as gluten intolerance, red licorice may be bad for you. Celiac disease is a condition where gluten, a protein found in wheat and other grains, causes an immune response in the small intestine. 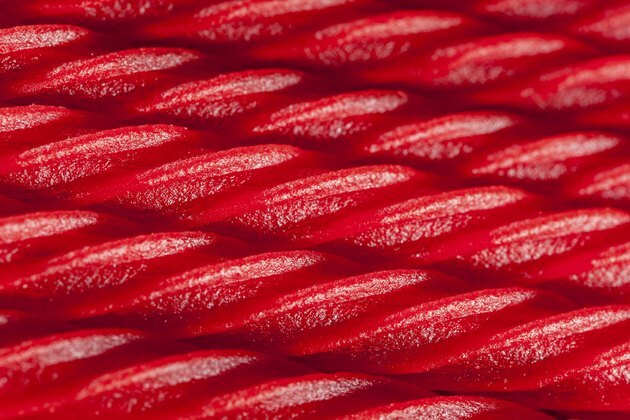 Red licorice candy contains wheat in its ingredients, making this candy harmful to your overall health and well being. A wheat allergy, caused by sensitivity to wheat itself, could also make candy licorice problematic for you. This may lead to minor allergic symptoms, such as hives or a potentially dangerous response referred to as anaphylaxis, where your throat may swell and close. U.S. Food and Drug Administration: Consumer Updates: Black Licorice: Trick or Treat?